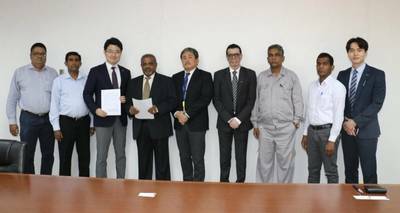 Sri Lanka's leading ship repair, ship building, heavy engineering and offshore engineering facility Colombo Dockyard PLC (CDPLC) inked an agreement with PANASIA, Korea as a partner for Ballast Water Management Systems (BWMS) and Scrubber installation. This collaboration with PANASIA will allow Colombo Dockyard to offer this service of installation of BWMS and Scrubbers to its clientele, said a press release from the ship building company is based in Colombo. Colombo Dockyard has already installed eight Numbers PANASIA Ballast Water Management Systems on its new construction vessels; this is an added positive factor for ship owners to look at Colombo Dockyard confidently for repair and installation solutions of BWMS. Panasia is a highly reputed manufacturer, to date, PANASIA has received BWMS orders for 1,300 ships and 250 ships are already being operated by ship owners worldwide. The synergies will give superior solutions to the ship owners to upgrade the vessels cost-effectively and efficiently to meet the required regulatory conditions.